A visiting card is a small paper card with a person's name on it. They were used to let someone know that another person had come to their home for a visit. Some visiting cards had just a name on them. Some also had images. Visiting cards are not used as much as they used to be. Business cards are now used the way visiting cards used to be used. Before the industrialization visiting cards were hand made. 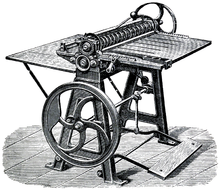 Since the end of the 19th century production has become more and more automated. This page was last changed on 7 March 2015, at 20:42.